Base of Operations: Damocles Foundation bases including Portland, Oregon and Brazil. Powers/Abilities: Dr. Joshua is a brilliant geneticst with access to sophisticated equipment, including a molecular disruptor. He wears clothing made from unstable molecules. History: (X-Force I#68 (fb)/X-Force I#69 (fb) - BTS) - The Damocles Foundation, through its Aguilar Institute arm, sent Dr. Joshua, Dr. Chandra and Dr. Ogada to awaken Ekatarina Gryaznova from her coma and arrange for her to be selected as one of Bastion's Prime Sentinels in Operation: Zero Tolerance so that they would have an agent within that organization. (X-Force I#13) - Dr. Joshua was hired by Gideon to experiment upon Sunspot, whom he had recently discovered was not an External, as he had hoped. (X-Force I#14) - Dr. Joshua bombarded Sunspot with solar energy, pushing the mutant's abilities to their limits. (X-Force I#79 (fb)) - Dr. Joshua transferred some of Sunspot's blood into Project 19, an infant mutant who was in the Damocles Foundation's custody. To his surprise, Project 19 began to regenerate from the physical deterioration it had been suffering from. (X-Force I#80 (fb)) - Dr. Joshua brought in Dr. Ogada and Dr. Chandra to examine Project 19 with him, but Project 19 ultimately broke free from his laboratory. Project 19 went on to become the mutant terrorist Reignfire. (X-Force I#15) - Dr. Joshua's experiments went over 3000% beyond Sunspot's absorbtion capacity, but before he could complete the study, Sunspot's friends in X-Force came to his rescue, and destroyed part of the facility bringing him to safety. (X-Force I#68-69) - Dr. Joshua joined Dr. Chandra and Dr. Ogada in performing an operation on Domino for Ekatarina Gryaznova, planting a device into her nervous system. They also studied Operation: Zero Tolerance's captives Meltdown, Rictor and Shatterstar, but had to flee when X-Force came to their rescue. (X-Force I#79) - After learning that Reignfire had reappeared in Las Vegas, Nevada, Dr. Joshua took a molecular disruptor from the Damocles Foundation's Portland base and set out to confront Reignfire. He drove there in a sedan specially designed with a cybernetic interface helmet for driving. He found Reignfire in the streets of Las Vegas battling X-Force, and fired the molecular disruptor at him, but Reignfire survived a blast, and then set Dr. Joshua on fire. Sunspot took the disruptor from him to fight Reignfire, but Reignfire wound up merging with Sunspot. (X-Force I#80) - Dr. Joshua tried to sneak away, but Siryn caught him and demanded to know his connection to Reignfire. 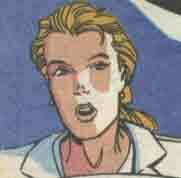 Dr. Joshua explained Reignfire's origin to her, and she demanded that he help them save Sunspot. Once Reignfire was defeated, he and Dr. Joshua were placed into the custody of S.H.I.E.L.D. agent Jordan Holiday. (X-Force I#96 (fb) - BTS) - Holiday was also working for the Damocles Foundation, and returned Reignfire and Dr. Joshua to the organization. (X-Force I#96) - Dr. Joshua and Dr. Chandra brought the remains of Reignfire to Odysseus Indigo in the Foundation's Brazil headquarters. (X-Force I#97) - Dr. Joshua assisted Dr. Chandra in bonding Reignfire to one of the Celestials' Gatherers as a solar battery, hoping to place the powerful being under their control, but when it was finally complete, the Gatherer was taken over by the Black Queen, and finally destroyed by Arcadia Deville and Moonstar. Comments: Created by Fabian Nicieza, Mark Pacella and Dan Panosian. Dr. Leah created by Fabian Nicieza, Terry Shoemaker and Al Milgrom. Dr. Leah was one of Dr. Joshua's aides as he performed his experiments upon Sunspot at Orphrah Industries.